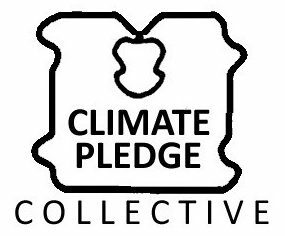 The Climate Pledge Collective is a set of pledges that let you reduce your carbon consumption in a way that works for you. You can print out one of the sheets below or Pledge Online by clicking HERE. Make your pledges then share them with a sponsor. CLEAN ELECTRICAL GRID – These pledge sheets were designed for use in Ontario, they focus on reducing natural gas consumption rather than electricity in the home efficiency section. Pledge Sheet (1-Page) PDF, WORD – A table of all pledges. Can you get 200 points? Trifold Pamphlet (2-Pages) PDF, WORD– This pamphlet contains a pledge sheet and instructions. Print 2-sided and SELECT ‘FLIP ON SHORT EDGE’ in your print menu. Description of All Pledges (5-pages) GOOGLEDOC – Provides information about each pledge. If you are going to sign up friends or neighbours, print one copy of this sheet to consult. DIRTY ELECTRICAL GRID – These pledge sheets were designed for use in areas with significant fossil-fuel based electrical generation, they focus on reducing natural gas consumption AND electricity consumption in the home efficiency section. Google Drive of All Files including graphics, logos and shareable pledge badges. Feel free to add your own pledges or redesign the sheets entirely. The pledge sheets have been designed in and for Ontario, Canada — which has a relatively clean electrical grid — so if you live somewhere else, we suggest adding more pledges about reducing electricity consumption.